The long awaited Great Australian Musical has finally arrived. 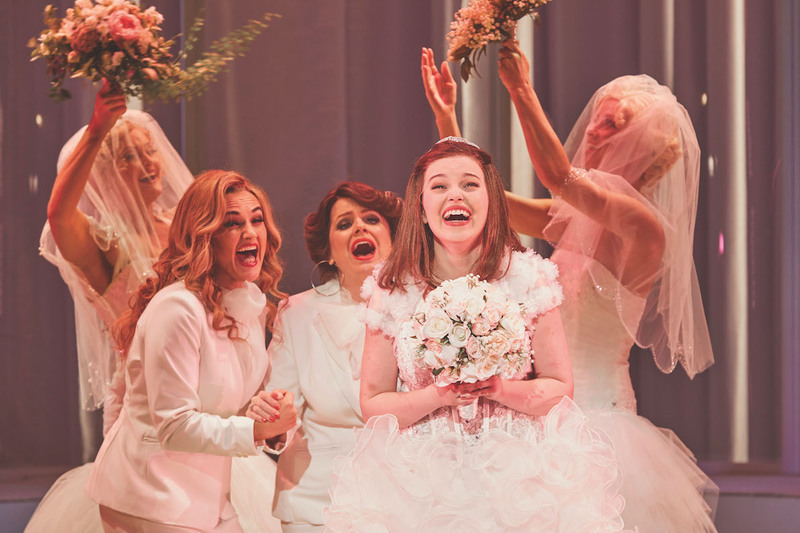 By turns hilarious and heart-rending, Muriel’s Wedding the Musical is as meticulously crafted and brilliantly performed as the best that Broadway has to offer. But this isn’t Broadway it’s Australia, in all its idiosyncratic glory. In updating the iconic 1994 movie for the stage, the combined genius of the creative team side-steps the cultural cringe by embracing and celebrating it rather than trying in vain to side-step it. Set in the present, the fantasy world of Muriel the millennial is served and hyperextended by the current limitless possibilities of instafame. After making a magical first appearance, Muriel promptly sets up the very title of the show with her I wish song “The Bouquet.” Desperately seeking the fulfilment of her dream wedding, Muriel is too blind to see the authentic best friend (Rhonda) and ideal boyfriend (Brice) who are right under her nose. Muriel’s lies and poor decisions can cause pain, and this aspect underpins the show’s successful avoidance of saccharine sweetness. It is instantly clear that the creative team and producers have struck gold with Muriel’s portrayer, Maggie McKenna. McKenna not only nails the delivery and the look of Muriel, but also has the soaring singing voice of an angel. By rights, ticket buyers will soon be selling their soul to see McKenna in this role just as they did on Broadway for Ben Platt in Dear Evan Hansen. PJ Hogan seamlessly updates his screenplay for the stage. The story holds up superbly, the latter pathos landing all the more painfully due to the initial rollercoaster of laughter and energy. Rhonda’s plight is moving, but it is the fate of Muriel’s mother Betty Heslop that really has intensity. Hogan had the inspired idea of casting legendary quartet ABBA as Muriel’s imaginary guardian angels, and his extraordinary knowledge of their lyrics elevates scenes in which he has deftly integrated their material far above standard jukebox-style fare. When ABBA takes a turn in guiding Betty Heslop, singing “SOS,” the whole concept reaches its zenith. 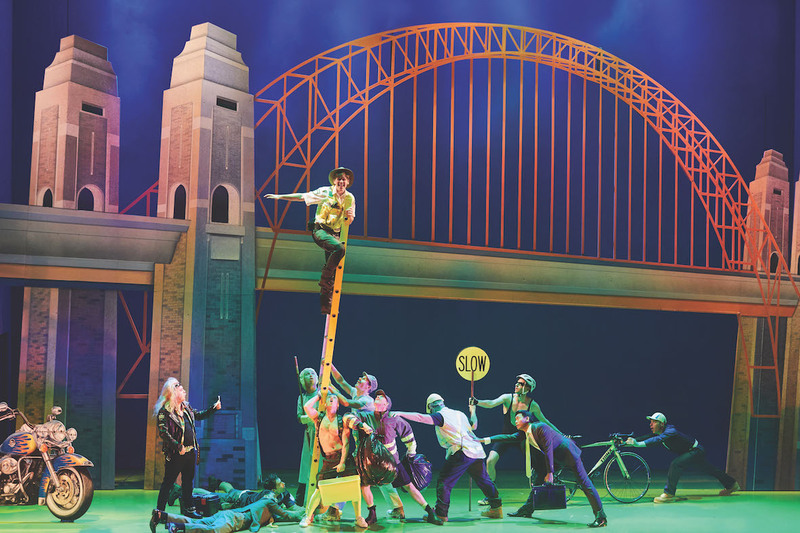 Much is written about the absence of the development path for new musicals in Australia, making young musical director Isaac Hayward’s world class achievements in orchestrations, arrangement and additional music all the more extraordinary. Hayward’s work is heard at its very best thanks to the vivid sound design of Michael Waters. A proven master at delivering new musical productions, director Simon Phillips shows a sure hand in guiding this material to new heights, expertly judging the balance of comedy and tragedy. Phillips uses ever shifting screens and panels as irises, drawing attention to the personal moments with cinematic flair. At 170 minutes (including interval), the one aspect where some more focus was needed was in keeping the sprawling length under more control. Phillips’ frequent collaborator Gabriella Tylesova designs both sets and costumes, unleashing a glorious cavalcade of colour on the stage. Trent Suidgeest’s lighting is crucial to these luscious floods of colour. Managing to be both simple and epic at the same time, Tylesova moves from small settings, such as a bed and a door, to the grand scale of Sydney’s Harbour Bridge and Opera House. Any number of small flourishes, frequently witty, bring visual delight along the way. Tylesova’s costume designs are quite incredible, propelling the company through dozens of distinct characters. The young and the restless of Porpoise Spit are contrasted with the bold and the beautiful of Sydney to great effect, with amazing wigs also adding the finishing touches. The bridal shop montages are filled with gossamer gowns galore, yet Tylesova still manages to outdo herself for Muriel’s Mariel’s wedding. Madeleine Jones develops a strong character with a relatively small amount of stage time. Jones’ forthright, down to earth Rhonda is the tonic Muriel needs but will not swallow. While platonic male pairings are common enough in musical theatre, a female duo is rarer, making Jones and McKenna’s chemistry all the more precious. 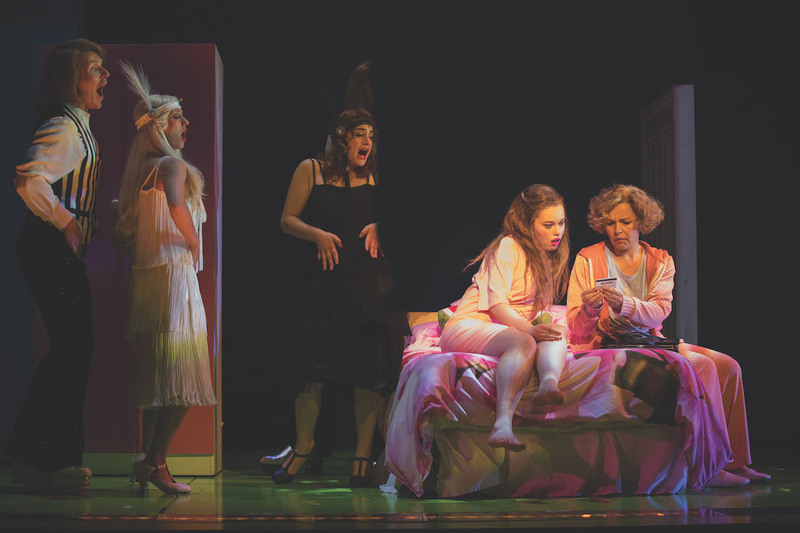 Somehow looking decidedly dowdy, evergreen actress Justine Clarke does a slow burn as poor, put upon Betty, fading away to the shadows until her climactic act two number. Gary Sweet finds one note as Bill Heslop and determinedly sticks to it. Helen Dallimore makes a modest contribution as Deidre Chambers. Christie Whelan Browne is luxury casting indeed as bridezilla Tania Deganos, landing every laugh and then some. Tylesova makes the most of Whelan Browne’s statuesque beauty to parade a range of stunning outfits. Emerging from the pool like a Greek God come down to earth, Stephen Madsen has a terrific entrance as swimmer Alexander Shkuratov. A gifted performer who has gradually been amassing an impressive resume, Madsen shows himself to be more than a chiselled torso, exhibiting sharp comic timing and a powerful singing voice. Ben Bennett is sweetly adorkable as parking inspector, and potential Sydney boyfriend, Brice Nobes. Jaime Hadwen, Sheridan Harbridge, Mark Hill and Aaron Tsindos capture the look, sound and sensibility of ABBA to perfection. Musical theatre lovers of Australia owe Sydney Theatre Company and Global Creatures a massive debt of gratitude for developing and presenting Muriel’s Wedding the Musical. Pray to the gods of theatre for an Australian tour. 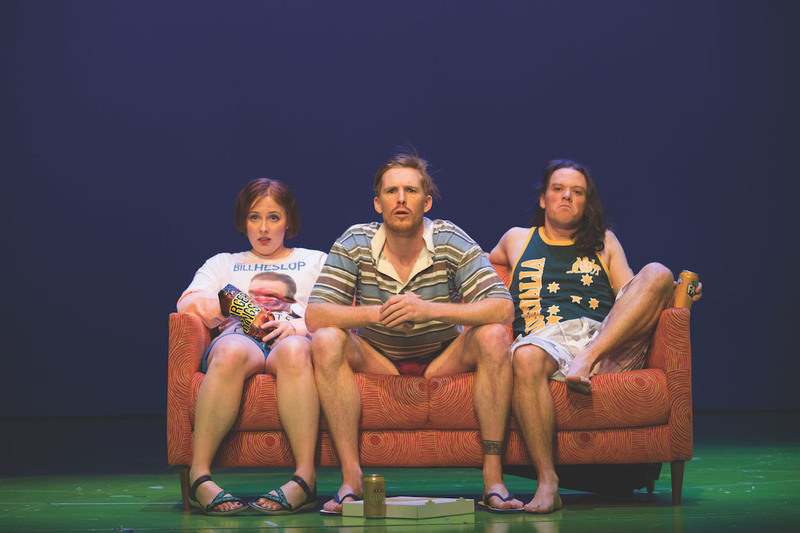 Muriel’s Wedding the Musical plays at Roslyn Packer Theatre, Sydney until 27 January 2018. Hmm can’t I say remember exactly. We’ll have to listen again when the cast recording is released..